Mosaddegh, M., Gharanjik, B., Naghibi, F., Esmaeili, S., Pirani, A., Eslami Tehrani, B., Keramatian, B., Hassanpour, A. (2014). A survey of cytotoxic effects of some marine algae in the Chabahar coast of Oman Sea. Research Journal of Pharmacognosy, 1(1), 27-31. M. Mosaddegh; B.M. Gharanjik; F. Naghibi; S. Esmaeili; A. Pirani; B. Eslami Tehrani; B. Keramatian; A. Hassanpour. "A survey of cytotoxic effects of some marine algae in the Chabahar coast of Oman Sea". 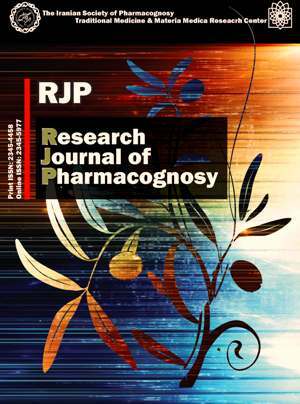 Research Journal of Pharmacognosy, 1, 1, 2014, 27-31. Mosaddegh, M., Gharanjik, B., Naghibi, F., Esmaeili, S., Pirani, A., Eslami Tehrani, B., Keramatian, B., Hassanpour, A. (2014). 'A survey of cytotoxic effects of some marine algae in the Chabahar coast of Oman Sea', Research Journal of Pharmacognosy, 1(1), pp. 27-31. Mosaddegh, M., Gharanjik, B., Naghibi, F., Esmaeili, S., Pirani, A., Eslami Tehrani, B., Keramatian, B., Hassanpour, A. A survey of cytotoxic effects of some marine algae in the Chabahar coast of Oman Sea. Research Journal of Pharmacognosy, 2014; 1(1): 27-31. 2Offshore Waters Research Center, Chabahar, Iran. 3Traditional Medicine and Materia Medica Research Center, Shahid Beheshti University of Medical Sciences, Tehran, Iran. Department of Traditional Pharmacy, School of Traditional Medicine, Shahid Beheshti University of Medical Sciences, Tehran, Iran. Iran has 1260 km of coastline that borders the Persian Gulf and the Oman Sea in the northwest Indian Ocean. Marine algae are one of the natural resources in the marine ecosystem which produce a wide range of new secondary metabolites with various biological activities that play an important role in the pharmaceutical care. In this study the cytotoxic activity of 28 marine algae of Chabahar coast was assessed against 5 cell lines including MCF-7, HepG-2, A-549, HT-29 and MDBK, through MTT assay. The methanol extract of the algae did not show cytotoxicity against any of the tested cell lines up to 100 μg/mL concentration, except for Jania adhaerens (IC50 85.03 µg/mL) against MCF-7 cells.